Kale has recently become one of those "in" foods. It is something that I never even knew about as a child, certainly didn't cook during my first 50 years of cooking, and only recently started becoming a topic of cooking conversations. But times change. Kale is now a staple in our fridge. My husband enjoys experimental cooking and he often adds kale. You should try his morning omelet! 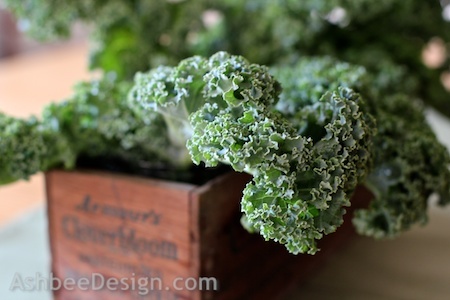 But, putting cooking aside, you can't deny that kale has an incredibly beautiful color and leaf. My garden is still brown, wild flowers are nonexistent in New England now, (although forcing forsythia is on the agenda), and it is time to pack away the Easter eggs and bunnies. Time for a centerpiece switch. How about kale? 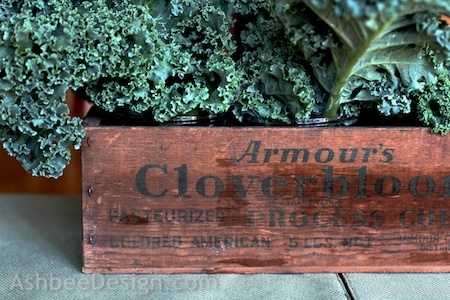 I took a bunch of kale, combined it with a old vintage cheese box from my dad, and created a new centerpiece. I save containers, especially wide mouth jars and I had three plastic jars that fit perfectly into this box. I put some water in and added the kale leaves. I love the visual texture! I hope David doesn't have too many cooking plans today! 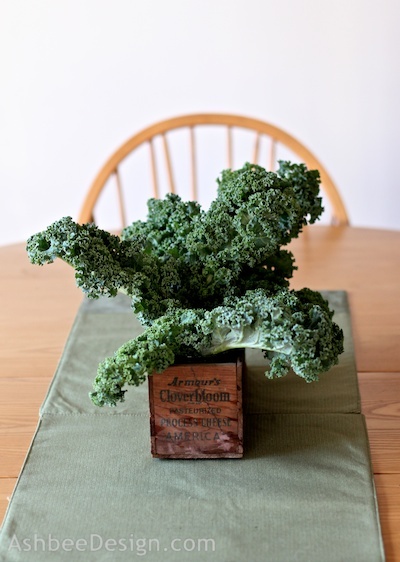 I routinely steal from the refrigerator to make quick, unusual centerpieces. What do you create with from your fridge? That's just beautiful! It is also very inspiring....I'm thinking Kale would be a great addition between a plate and saucer too. Thanks for sharing it and inspiring me as well. Have a great weekend! I just love the color of kale and find the leaves visually so beautiful. I never want to eat it, just look at it. So I put it on display! Much cheaper than flowers! Thanks for visiting and commenting. I thought you should know that Pinterest is blocking access to your site (inappropriate content) through the photos of the PVC tool holders on other people's Pinterest boards. You need to contact them, because your site is really interesting! Thanks for the heads up Barbara. Off to email Pinterst now.